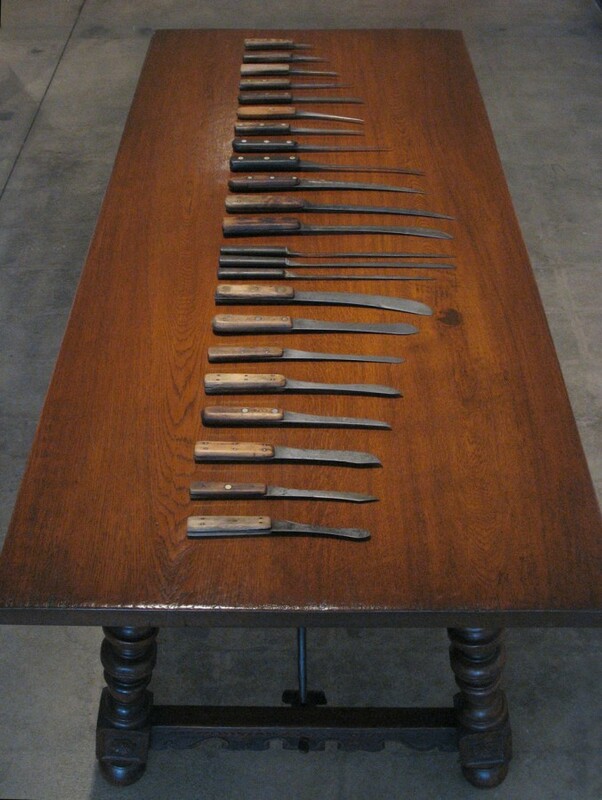 Binomial 3 consists of severely worn knives on a library reading table. Arranged in a binomial curve, I sought to cross the law of averages and scientific management with the attrition of labor. Here, I’m interested in the likeness of words and knives: they are both used as tools to parse large, undifferentiated things into smaller, distinct parts. The work of knives and words is repetitive, and yet they never cut exactly the same way twice. Knives and words are the instruments that create meaning and market value out of the chaos of “nature”: animals become meat, silver (the mined metal) becomes “silver” (a coveted heirloom,) and the ability to name implies ownership. Sometimes the roles are reversed, and (as illustrated here) the material wears the knife down, or exhausts a word.